This heaping pile of concretions was left behind for others to enjoy. There is something special about Taylor River concretions. Maybe it is that they tend to resemble animals, or it could be the amazingly beautiful mountains and rainforest of Washington state, which are the backdrop to this locality. Whatever it may be, everyone who sees them loves them. These abundant oddities are worth checking out if you are in the North Bend, Washington, area. Concretions are also commonly known as “fairy stones”. 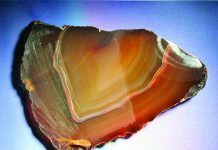 They are a type of geological oddity that typically occurs in sedimentary rocks, such as shale, limestone and sandstone. There are various theories of how they are formed, but it is typically believed that they formed in layers around a nucleus. These particular concretions are thought to have formed when ancient silt from high in the mountains was released by glacial activity. 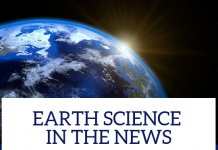 The silt was deposited on the bottom of glacial lakes, where the concretions likely formed around some sort of nucleus, perhaps a grain of pollen, too small to see with the naked eye, or a seashell. I have even found concretions that formed around river rocks, which look as if the concretion is crawling along the rock. While some concretions contain fossils, these concretions do not. An option is to dig directly into the clay bank to find concretions. At our current time in history, all the ancient glaciers have receded, and the Middle Fork valley is left exposed. All that remains of all this ancient glacial activity is a carved valley with a long river and branching tributaries. Tumbled river rocks and ancient clay banks have been left behind in random spots along the river. I have been mining quartz crystals up the Middle Fork Snoqualmie River, and have heard many stories of the Taylor River concretions. Many quartz miners make this locality a side trip on their way off the mountain, and this year, I finally took the time to get there. Now, it is a new favorite collecting locality for me. My first time there was memorable. I went with my good friend Brittney and my Uncle Matthew. We were lucky enough to meet the fairy stone guardian, Udo. This character has been collecting here for over 20 years, and can often be encountered during warm summer months. A very nice fellow indeed, Udo was there to assure us we had found the right spot. While Udo has collected many thousands of concretions, he does not take them from the river. Instead, he makes huge, heaping piles of them, which he incorporates beautifully into the landscape. Upon looking closer at the piles, we noticed concretions resembling animals that had googly eyes glued to them. I laughed out loud when I saw this! Finding the Taylor River concretion locality is fairly easy, and it is very close to Seattle. Whether you are coming from the east or west, you need to get on Interstate 90 and take Exit 34, a little southeast of North Bend. Travel north on 468th Avenue, past all the gas stations, for 0.4 mile, then take a right on SE Middle Fork Road. In 2.8 miles, SE Middle Fork Road becomes NFD 5600 Road. Continue for about 9 miles on NFD 5600 Road and cross a small, bumpy bridge over the Taylor River. Park immediately, close to the bridge. You should have seen the Middle Fork Campground just before the bridge and the Taylor River. 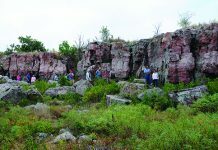 The concretion locality is on Forest Service land, which is typically open to the public. Call the North Bend Ranger District at (425) 888-1421 to get current information on access. Once you park your vehicle near the bridge or Middle Fork Campground, work your way down to the Taylor River and head upstream. It is a five- to 10-minute walk. Notice that all you see along the river are big river rocks. The concretions will be eroding out of clay banks, so keep your eyes open and look to your left, because that is the side the clay banks are on. 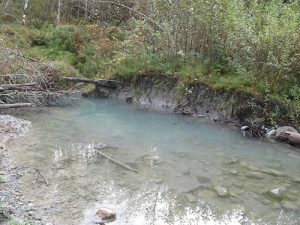 Banks along creeks and streams offer prime fairy stone discovery. The main clay bank exposure is not large. It is 5 feet to 10 feet high and 50 feet long. The concretions, however, are abundant. They are constantly eroding out and can be found all over the riverbank. One can simply walk around the vicinity of the clay bank and pick them up. Another idea is to go to the clay bank and pluck them right out of the wall. This clay bank exposure is the main one; however, there are a few other clay banks close by that are trickier to find. They can be located by following tributaries upstream and simply looking for clay banks. It is important to understand that these exposures are largely overgrown with brush. If you walk through the brush, you can also find the concretions where the topsoil has eroded away, revealing the clay underneath. By snooping around, you will soon realize they are everywhere. 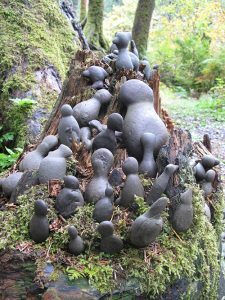 The amazing thing about these concretions is that they resemble real creatures. Common shapes are the snowman and the dolphin. Rarer shapes are the Buddha and dragon. It is comical how close the resemblance is; they will instantly strike a chord with anyone. Now that you have discovered heaps of amazing concretions, you may want to leave them as they are or you can clean them up a bit. Simply soak them in water for an hour, then use a wire brush or toothbrush to get to get the excess mud off. Since these concretions tend to resemble animals, you may even want to glue some bobbly eyes on them and give them a bit of character. 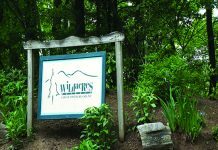 If you are looking for some other activities to partake in while you are in the North Bend area, my best suggestion is to make reservations for the Goldmyer Hot Springs. These wonderful hot springs are farther down NFD 5600 Road. People book in advance, then park their cars at the gate and make the hike to the springs. When you have been collecting all day, this is certainly a nice way to end the day. Taylor River concretions are a ton of fun, whether you are a seasonal mineral miner or new to rockhounding. This spot is easy enough to access, and it is set in the beautiful Middle Fork Snoqualmie River valley. Come during the summer when the weather is hot and the river is low. We hope to see you there! 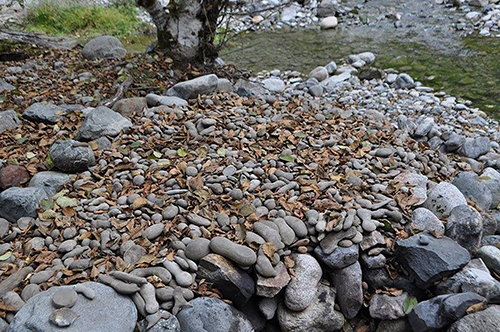 This pile of “fairy stone” concretions brings life to the forest along the Taylor River.